How much do I owe? : Is There A Problem Here? : How much do I owe? 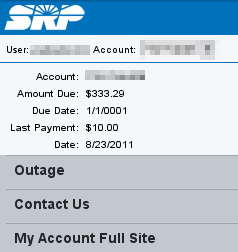 I check the balance on my electric bill online to see if a recent payment has been applied. The mobile version of the web site shows me a value that is less than I expected -- whether or not the payment had been applied. I then check the full web site and it shows me a higher than expected amount. In order to verify whether the two versions of the web site have the most current data, I go to a payment kiosk and make a small $10 payment, and then recheck the mobile and full web sites. They still show different amounts and the payment I made at the kiosk today. (I recently switched from a bill-after-use to a pre-pay rate plan, so there's about two months worth of usage due during the transition. ).